It's been weeks since i last casted a lure into a body of water. Busy times are showing themselves and those days left free are being used to rest the aging body. It was a breath of fresh air and hope that made the fools arrange for fishing on a Friday morning. Alas... they both couldn't wake up but still, somehow, someway...after lunch, they managed to drag themselves out of bed and lug their fishing stuff to a good ol water hole that we knew wouldn't disappoint us. I was first to reach and begin the usual laborious fishing of casting a lure into the water and retrieving it continously like what most passerbys would call an idiot. I clipped on a topwater pencil and worked it as close to the leaf cover as possible. A flash of orange and a Peacock came out to tap the lure... It missed horribly and went back to its hiding place. This one was protecting its lair... and not wanting some food. The next few casts proved to be bad misses too and i gave up after awhile. The fly man came and this time he had more evil creations... namely rabbit fur flies and buck hair flies. I took an instant liking to the rabbit fur. It made a tentacle jellyfish hanging action during the pause. The lime green fly was a killer and it made the school of baby... Temensis?.. excited. There were at least a 50 of them swimming close by and they attacked my flies with no second thoughts. We landed quite a few until we miserably got our poor flies onto the tree tops. River Monsters Season 2 Is OUT! I'm sure almost everyone would have heard of the River Monsters series on TV. National Geographic Channel is giving fish and fishing lovers a treat by supplying us with relevant shows. There's Monster Fish too. In fact there will be another fishing show opening this month! Anyway, below titles are for reference so you can search for the series on Youtube or Torrent it. I find season 2's episode 2 very relevant to Singapore Anglers as we have the Toman as a very common fish in our waters. But then again, the show's extremely exaggerating and even labels Tomans as poisonous... and Human eating?! I guess it's to make the non fishing friends excited! Hehe! I've been following the Extreme Fishing series for quite some time now and one of the main reasons that I've been glued to it is that there is something different in every episode. This crazy fella goes all over the world and uses all sorts of fishing methods from kite fishing, noodling, archery fishing, spear fishing and so on. Of course, there is still conventional fishing being used! Another aspect of the show that i like most is that its a show that even non fishing lovers will appreciate as he goes all over the world and samples different cultures. There's not only non stop fishing but Robson stops over and samples different things which include fried flys and other strange foods. Good commentary and good videoing makes the show quite the documentary. I've covered season 1 & 2 and am currently on season 3... Fishing in Kenya! The Snorkeling mayhem does not end here... 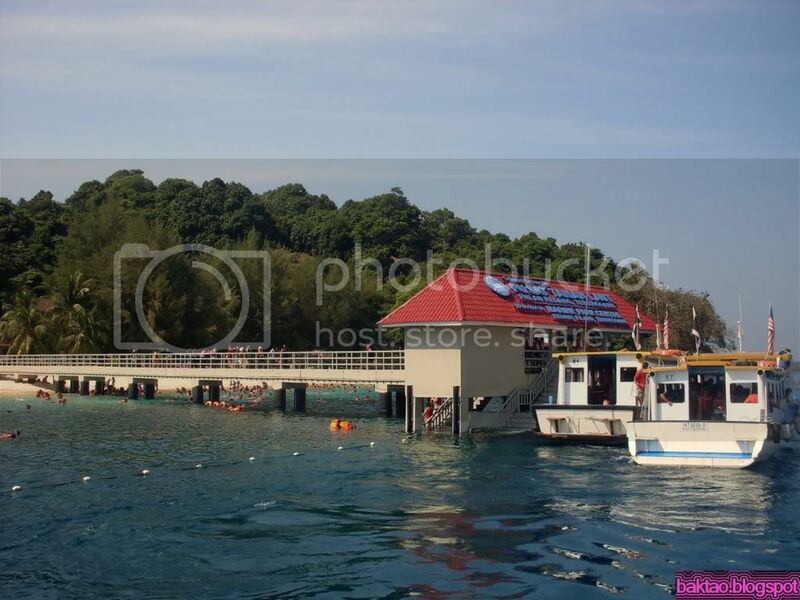 The next day, we made a trip to the Redang Marine Park also known as Bukit Batok Swimming Complex. Here, the massed formations of various resorts came and mingled as one with our resort. The effect was massive and i can't confirm that no fish were hurt! Doesnt look that bad lay... U sure? !